"One of the leading English composers of his generation, Vaughan Williams was a pupil of Parry, Charles Wood and Stanford, and later of Bruch and Ravel. In his work as a composer he went some way towards creating a specifically English musical idiom, influenced by his interest in folksong but coloured by his own personal vision and language. The stage music of Vaughan Williams includes the Shakespearean opera Sir John in Love (based on The Merry Wives of Windsor), the masque for dancing Job, and The Pilgrim's Progress. Incidental music for the theatre includes music for The Wasps by Aristophanes, from which the overture is often heard. He also wrote a number of film scores. Vaughan Williams wrote nine symphonies, the first A Sea Symphony for solo singers, chorus and orchestra (with words taken from Walt Whitman), the second A London Symphony, and the third Pastoral Symphony. The Sixth Symphony, completed in its first version in 1947, seemed to break new ground and was followed by a seventh, the Sinfonia antartica, that had its origin in a film soundtrack. Compositions by Vaughan Williams for solo instrument and orchestra include the pastoral romance The Lark Ascending for solo violin and a Concerto accademico for solo violin and string orchestra. There is an attractive Oboe Concerto and two concertos unusual in their solo instrument: one for harmonica and the other for bass tuba. Flos campi uses a viola and is scored also for small choir and chamber orchestra. 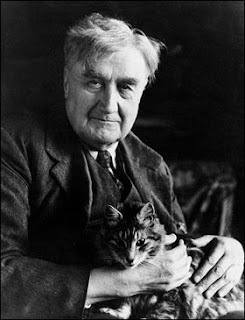 Vaughan Williams made direct use of folksong in, among other works, his three Norfolk Rhapsodies, his Fantasia on Greensleeves for solo flute, harp and strings, and his English Folksong Suite for military band. His Fantasia on a Theme by Thomas Tallis for two string orchestras returns to the 16th century for its musical inspiration. This playlist was compiled after the work list on AllMusic (sorted by year), plus a few works that are not listed there, like the Bucolic Suite, and Dark Pastoral. Different editions and arrangements by the composer are also featured: 1920 version of A London Symphony, 2008 edition of Symphony No.5, original version of Symphony No.6 (premier recording by Stokowski), original version of The Lark Ascending (for violin and piano), the composer's arrangement of his pupil Patrick Hadley's Fen and Flood, and more. The Wasps are presented with the popular suite, and the complete incidental music (about 100 minutes). The lovely Serenade To Music comes in three versions: 16 soloists, 4 soloists, and orchestra alone. At the end of the playlist there are some recordings of the composer's speeches, and a excerpt from his funeral service. Get this collection in one Spotify playlist: Ralph Vaughan Williams - Complete Chronological Catalogue (755 tracks, 55 hours). Ctrl (CMD) + G to browse in album view. Vaughan Williams arranged many English hymns and carols, you can press Ctrl (CMD) + F and input hymn, or carol, or Christmas, to look for seasonal music in this playlist. Thank you! In my opinion, RVW is the most underrated composer of the 20th century. Very useful article .Very interestinf content . Thanks for share it.